When “Music With Changing Parts” premiered in New York in1970 it was at once revolutionary, persistent, repetitive, annoying, hypnotic, challenging, and otherworldly. People walked out while others were completely mesmerized. The future had arrived and Philip Glass (then 48) was our cultural time traveler. Tonight’s unrelenting performance at Davis Symphony Hall was also confrontational, the way meditation is; Cyclical, both historically and as a spiraling composition, and spellbinding if you can surrender completely to it. After decades of assimilating Glass’s minimalist vernacular it seems more timeless than futuristic, like the 81-year-old composer who astutely played keyboard. A few people walked out, certainly not as many as in the 70s. Some fell asleep, most took turns letting their eyes drift from the stage to the audience, ceiling, program, watches, as others sat on the edge of their seats, forcing themselves to keep up and to stay present with this transcendent composition. Musicians and chorus worked equally hard not to trance-out and to keep exact with Michael Riesman’s conducting. Riesman was also one of the five keyboardists and was flanked by music director and principal chorus conductor, Valérie-Sainte-Agathe, whose lioness mane and feathery black gown brought levity and theatrics to this seriously muscular performance. “Music With Changing Parts” is arranged as an open score that allows for interpretation, not only by the number of instruments used but also its duration. It can be played with seven to nine musicians. 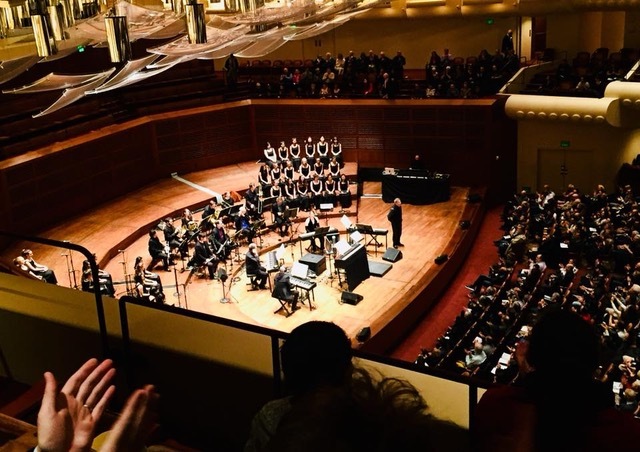 This evening it was presented in its recently updated version with the San Francisco Girls Chorus and Students of the Conservatory of Music, 35 total and an ensemble of 15 musicians. It has been performed from an hour to two hours, with this performance clocking in at an hour-and-a-half. “MWCP” is unique among Glass’s works in that it was created with the most allowance for improvisation, primarily by the conductor more than musicians, as they extend and reiterate brief melodic fragments creating a sonic landscape—a sound that is both industrial and as mechanical as the workings of a clock and, as natural and organic as variations of a rainstorm or as intense and electrifying as chorus of Amazonian insects. The hypnotic sound it creates, with the velocity of a train passing through one’s psyche, is something that Glass once swore he wouldn’t produce in other works, calling it a “bit too psychedelic” for his liking. He thinks of this work as transitional within his very prolific 1970s period and only recently returned to it by enlarging the original score with a brass and vocal arrangement. Both enhance “MWCP” handsomely, with the chorus greatly unifying and harmonizing all the independent and moveable parts—like a net thrown into space. In one segment both chorus and brass unite as one sound, at other times the chorus is a simple drone. When least expected, they engage in a chirping-like melody. From the immediate start it’s clear that “Music With Changing Parts” will have to end as abruptly as it began. However, the introduction a four-four count that ushers in a tangible, more popular melody of descending chords during the last minutes of the piece is surprising. It’s as if being pulled and condensed from this cosmic stratosphere of sound into a pop melody on the radio. Perhaps this recognizable melody is built-in to bring the ensemble into a more finite and earthly reality, since they are all playing different places in the composition. However, as Riesman gestured the last four-four count, the ensemble slid into the final note rather than stopped on a dime. Without pause, forgoing a dramatic silent break that “MWCP” so much deserved, Riesman turned to the audience that already had jumped to their feet in ovation. “Music With Changing Parts” is still changing, as is Glass. With the passage of nearly half a century, it is inspiring to see Glass perform live, to see how well his music—and he himself– have held up over time. Few contemporary composers have overlayed their signature into the cultural Psyche and contemporary history as pervasively as Glass. It’s hard not to be humbled by his enormous contribution or to feel honor in his presence.